I love it when I have an actual occasion to bake for. I find most of the time I am baking for a baking group assignment or just because I have a compulsion to bake every few days or so. So when I saw my friend Sharon's birthday was coming up on the calendar my mind kicked into to gear to decide what to make for the occasion. Cupcakes! Everyone loves cupcakes right? Sharon's favorite cake is vanilla cake with vanilla frosting. I rarely make white cake (since I'm a chocolate girl through and through), so I went in search of recipe. I added Martha Stewart's Cupcakes cookbook to my collection a few months back but had not had the opportunity to break it in. If you can call making one recipe breaking it in...we are now broken. I made her white cupcake recipe. I cheated a bit on the frosting and used Trader Joe's white frosting box mix. And to spruce it up I filled the cupcakes with raspberry jam. The cake was light and tender. The frosting was super sweet...think buttercream. And the tartness from the raspberry jam brought it all together. Next time I would try a lighter frosting...like this whipped cream frosting. When we ate them I think we all had a major spike in our blood sugar, but they were still tasty! Preheat oven to 350 and line muffin tins with paper liners. In a medium bowl, sift cake flour, baking powder and salt and set aside. Stir vanilla into milk and set aside. Cream butter with an electric mixer on high until smooth. Slowly add in sugar and beat until the mixture is pale fluffy. Reduce speed to low and add flour mixture in thirds alternating with the milk mixture until everything is just combined. In separate bowl beat eggs whites on medium speed with an electric mixer until stiff peaks form. Fold a third of the egg whites into the batter to lighten the batter. Gently fold in the remaining egg whites in two batches until just incorporated. Use an ice cream scoop or spoon to fill cupcake liners 3/4 full. Tap muffin tins on the counter top to release any air bubbles. Bake for 18 - 20 minutes, rotating the pans halfway through baking. A toothpick should come out clean. Cool on a wire rack. To fill cupcakes with raspberry jam, cut a cone shaped hole out of the top center of the cupcake and set it aside. Fill with a teaspoon or so of jam and then replace the cut out piece of cake to fill the hole. 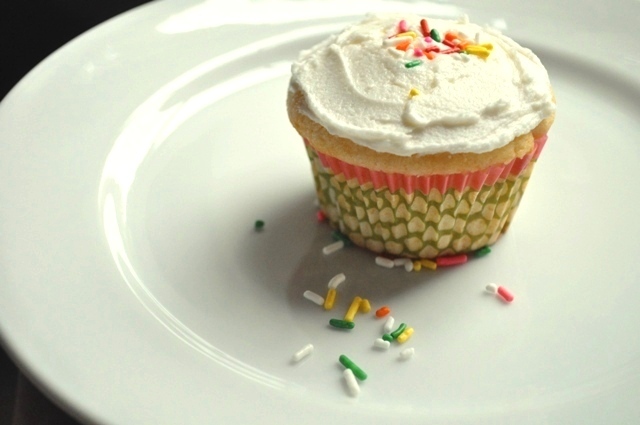 To see an example of filling a cupcake, click here. Top cupcakes with a frosting of your choice. I love having an occasion to bake for too - it means I don't have to call my mom, friends, etc and ask them to take things off my hands :) Though it does add a bit of pressure since I always want things to turn out well when I'm bringing them somewhere. Your cupcakes sound phenomenal, white cake is one of my favorites! The recipe sounds so good as the cupcake picture! Thank you for sharing thin recipe! I think I will give it a try! I always love vanilla cupcake and adding some bits of sprinkles will make it yummier for me even if I am old enough to love sprinkle on my cupcake. LOL. Your cupcake looks perfect and I can imagine that it taste good. My friend and I just made these and they are absolutely delicious! Actually, Vanilla Cupcakes are my most favorite of all the cupcakes. Thanks for sharing the recipe!